So, my mom calls last week and we're having our standard phone call where she's recounting details of the hideous hat my Aunt Gertrude* wore on their last lunch date or my Aunt Mildred's* strange obsession with bird feeders. All the while, I'm reading food blogs on the internet, occasionally throwing in a "Mmmm hmmm" or "Wow! I can't believe she did that" at appropriate intervals. Things are proceeding along fairly normally until my mother casually says, "Oh, so Aunt Ethel*, you know the one you met when you were two? The one who gave you the doll? Yeah, that one. Well she's visiting your city and I told her she should definitely drop by and visit because you ask about her all the time." Now, the average person would have pointed out the MANY fallacies in my mother's statements. The smarter person (i.e., me) quickly snapped out of blog reading mode and into disaster control mode because I knew darn well Aunt Ethel was making her way to my house at that very moment. I could either spend the precious seconds trying to reason with my mother or spend them cleaning purple slime off the kitchen counter (don't even ask). So there I am, frantically shoving what the hubster lovingly refers to as my shoe shrine (30 pairs of shoes, ranging from my Chuck Taylors to my work heels) into the hall closet all the while dodging falling basketballs and winter gloves which were perched precariously on the top shelf, when my mother calmly says, "Oh, and don't forget to offer Aunt Ethel a snack when she visits." A snack?!? I was just about to ask if Aunt Ethel was a fan of pizza bites because I was sure we had a Costco-sized bag of those addictive little buggers in our freezer when the doorbell rang. Ah Aunt Ethel, never on time for family gatherings, always on time for unexpected visits. Luckily, I had a giant bag of frozen samosas in the freezer that I could fry up. This was truly a godsend because a) I am sure Aunt Ethel would've called my mother the second she left and told her exactly what a failure I was if I'd served her pizza bites and b) I don't think she would've truly appreciated the joy that is a pizza bite so I certainly didn't want to waste them on her. So, I busted out the bag of frozen samosas and smiled politely while Aunt Ethel proceeded to nosily rifle through my kitchen cabinets while recounting details of the hideous hat my Aunt Gertrude wore on their last lunch date. All I can say after hearing about this hat for the second time is, that must be one hot mess of a hat. So, samosas. These are not the fat, vegetarian, Indian samosas that are wrapped in a pastry that is almost like a pie dough. Rather, these are ground beef filled, Pakistani samosas. I use the same crispy wrapper that I use for my egg rolls. 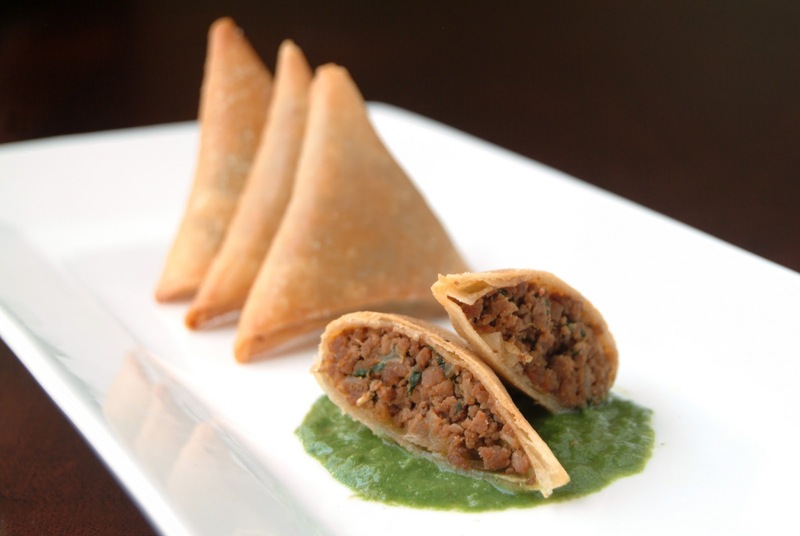 Samosas are also like egg rolls in that they provide a delicious supply of food at the ready. Hungry hubster? Fry up some samosas. Feel like a snack during that awfully long period between lunch and dinner? Fry up some samosas. Unexpected guests? You got it, fry up some samosas. When nosy aunts come to visit and I'm worried about the report they'll give to my mother, I serve my samosas with a lovely mint chutney. When there are no aunts in sight, the hubster and I eat our samosas with ketchup. Pedestrian and yet, delicious. And even though they're a bit complicated to fold the first time, you'll soon be a folding pro. The best advice I've ever gotten came from the kindly (and toothless) old man who owns my favorite samosa stall in Pakistan. Early on, you shouldn't worry too much about making perfect triangles. He said this as he effortlessly folded perfect triangular samosas, chatted with his friends manning the neighboring stalls, and did hundreds of rupees of business. 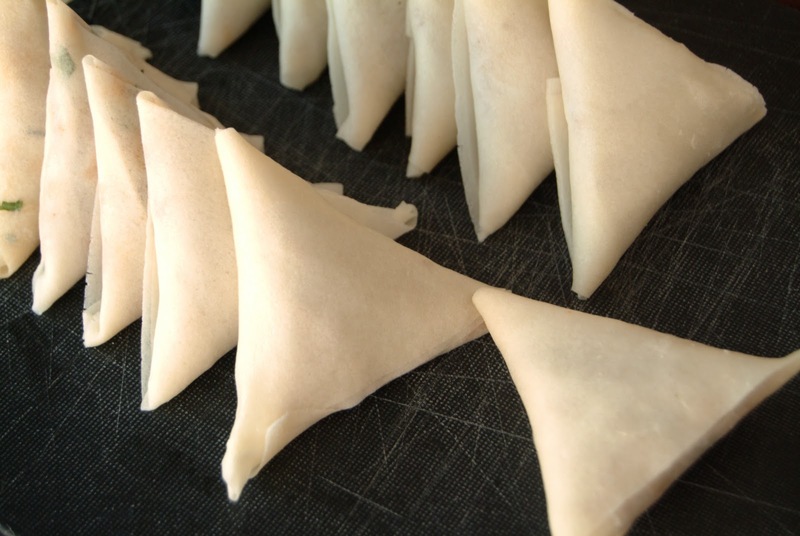 His mad samosa folding skills aside, I think his point was that if you focus on folding tight samosa parcels to ensure the filling stays inside, the perfect triangular shape will automatically come with time. Just remember, the perfect triangular shape better come quickly because aunts, especially ones named Ethel, have a tendency to talk. *Aunt names have obviously been changed to protect the innocent (i.e., me). My aunts have a mean left hook and I don't want to be on the receiving end. Saute onions until translucent. Add ginger and garlic and cook until fragrant. Add ground beef and spices (you may want to start with half the amount of spices listed above and then add more spices, seasoning to your preference. The potency of ground spices tends to vary between brands). 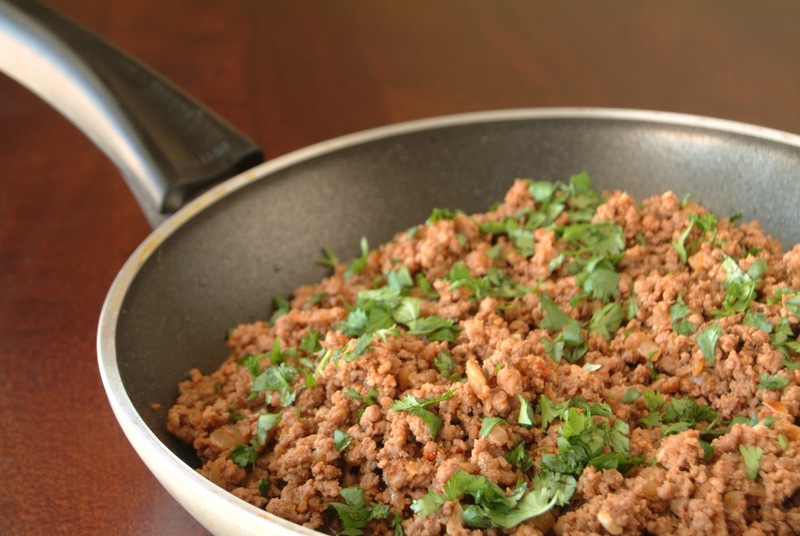 Brown ground beef, making certain all of the ground beef juices have burned off. Remove from heat and let the ground beef cool. The mixture should be almost completely dry at this point. Add chopped cilantro. Peel off two sheets of spring roll pastry at a time. Cut the double sheet into thirds. 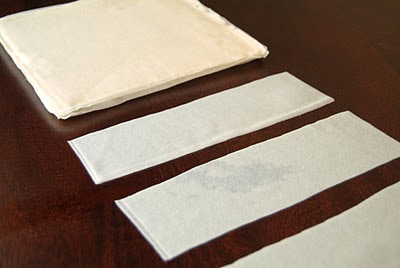 Keep the remainder of the pastry sheets under a damp towel so they do not dry out. Fold each third (double sheet) into open-ended triangle. Fill with meat mixture. Complete folding into a triangle and seal with a flour/water paste. You should have one pastry sheet remaining at the end. That is the samosa folder's reward. Fry that baby up and eat it while you're waiting for your samosas to dry out. Dry the folded samosas in the refrigerator. Store in a ziploc bag and freeze. Fry as needed. I imagine you could spray the samosas with a non-stick spray and bake them but this is simply conjecture. If I'm going to eat samosas, they're going to be fried samosas. Serve with a dip of your choice. Ketchup is a completely acceptable, and quite possibly, perfect dip. I love these and have always wanted to make them!! Did your aunt eat 36 samosas? That is one h$ll of an appetite. I, too, enjoy the pizza roll. Glad your supply was spared. This post makes me thankful that my nosy aunts Mildred, Gertrude and Ethel are too far away to ever drop in unannounced. Good old Aunt Gertrude...I have a few of those in my life. I agree that frying up a couple of samosas are the best way to get through the unexpected chai drive-by! I am extremely lazy though and I simply steal premade bags from my mother-in-law's vast freezer. And in a pinch TJ's frozen ones do the trick! As a random aside - your nails are perfect! I won't scare you with a photo of mine. Your story made me laugh...I just had my mother's cousin drop by unexpectedly and without warning...strange, given that I live on a small island 2.5 hours from the mainland...maybe he knew that if told me he was coming I would've made a run for it! mmmmmm samosas. they look lovely! excellent wrapping job. I got some grass-fed beef in the frig. I am so making this - love the lighter, crispier wraps! Great job on wrapping, very professional - this whole post made me giggle. Those desi aunties always have something to complain about, hehe. 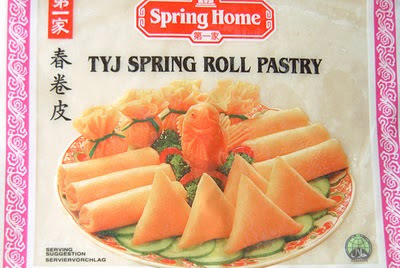 I was just helping my MIL make spring rolls with the same brand of wrappers! Your samosas look great, although I have to admit I think I've eaten my fair share this month! 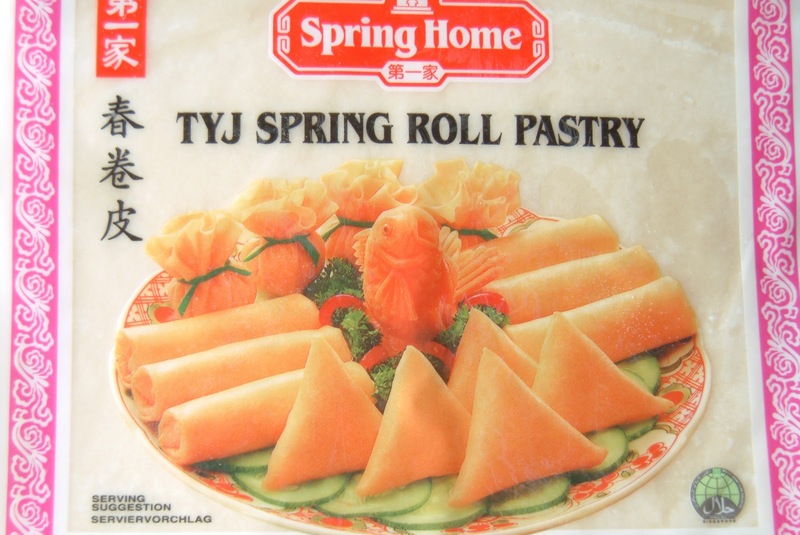 It's exciting to see that we use the same brand of Spring Roll pastry! My samosas never turn out as perfect triangles as yours, so I must practice doing origami more often. Oh yes, and I'd better get a manicure. I have nails envy! Can i just say that i absolutely love ur nails and the 1st pic looks like its out of a mag. I bought samosa wrappers and was all prepared 2 make them one day but when i came to the folding bit, i screwed up big time (even youtube couldnt help me). I had to throw away the entire packet of wrappers and had to eat the mince meat with roti. I have just bookmarked this as something to make, I would love to give these a go and I will have to email you for suggestions when I make them! Ps. Where do you get those spring roll wrappers? Are they just like the ones you can get from the asian store? Thank goodness you keep a supply of those lovely little packages on hand! My aunts would have had to settle for the pizza rolls! oh babe! read your post right in time! going through exactly the same thing...my FIL invited some "relatives" I haven't seen in a while.Good God! Its for lunch tomorrow and I'm over the place right now making a good Eid Meal! well I forgot to say in my own "dilemma",Love the samosas. And Egg rolls are such a saver! imagine making all that wraps for samosas from scratch! Love these samosas! I never realized how easy they were to make (minus the folding part, yikes!). Yours are folded perfectly, and can I add that you have beautiful nails! Always love reading your hilarious posts. Those are perfect little triangles! Hey we use the same brand of pastry haha. Your post always makes me laugh! I love your samosas with the thinner wrapper. Plus because they are smaller you get more crust with filling hence more crunch! I don't even know what to comment on. There's so much it could end up being longer than your post. Wow, is your family really like that? And we're not related??? Samosas...never heard of them; now that I have, I can't wait to give them a try. Thanks lawyer-dudette. Oh auntie gossip. It never gets old. I think I just ate 8 more samosas. Where is samosa rehab? Haha! I have an uncle who likes to randomly stop by. Luckily, he doesn't know where I live, but he's been known to call my parents and say "hey, guess where I am?" And he lives 8 hours away! These look sooo good! I've been wanting to make samosas for a long time! Jewish aunts are the same--they just show up on unexpected visits and report back to mothers. Sigh. What we go through. In other news, I've never had a Pakistani samosa, but I can totally see how awesome these would be with ketchup--the beef, the onions. Yum. That's a pretty amazing dish for something done on the fly! They look fantastic..I can only imagine how good they taste.. and mint chutney? yes please! Love your pics. This is one Indian street food I can't live without. You have made it look so simple to make. Let me go back and drool at your pics. Oh unexpected visitors. Things are so much better for me now since we have no family here but in India, visitors and guests would drop by unannounced and boy was it annoying. Nothing made them leave, I mean I have stories, so lets not get into that. I use filo sheets to make samosas, but the spring roll pasty sounds like a great idea. Yummy food as always! I'm loving reading the comments because everyone is saying exactly what I was thinking while I read your post. Wow - her nails look great. And, OMG, I'm not sure I'd EVER be able to make such beautifully folded samosa's. But the recipe sounds so fabulous that I'll have to try!!! Your samosas look perfect! Your aunt should have nothing to complain about. Except maybe that hat. It sounds photo-worthy. Not sure how you make them look so perfect... you must have magical dexterity in those little paws of yours! Crazy old aunts. We all have them. We all love them. Sometimes we all love to hate them. These homemade samosas look awesome! When I drop by for an unexpected visit, which is bound to happen one of these days, I want THESE. I'm glad you managed to make your aunt happy and those samosas look delish. My makes them with flour tortillas but I will have to try them with the spring roll spring roll pastry sheets! btw...congrats on making the FoodBuzz Top 9!! Hmm....I am really scared of old aunts too..they are critical and so hard to please. But using the spring roll pastry dough idea is something I ll buy at first stance...easy and decadent! Great samosas Azima! And oh boy don't you just love moms and aunties. Good save on a snack with these beauties! Those look so good. I need to get creative and try to make some. Hopefully, I won't have to do it in a minutes time! You always put a smile on my face and you and your samosas came through with flying colors! Thanks for giving me another use for egg roll wrappers once I've used 8 or so to make eggrolls :) Good luck with Project Food Blog! They look fantastic! Definitely would love to try this. My family is too afraid to fly overseas, so I do not have that prob, yet! As my husband's family is Punjabi, I know about these aunties and what is expected when they drop in. A snack, is really the same thing as a mini feast, and they are not that easy to put together. Your samosas look excellent. I'd try them but i am afraid of deep frying (after i once started a big fire that way :0). The samosas look wonderful... great wrapping! these look delish! can't wait to make them! Your blog is awesome. I love your honest, witty and engaging writing style and the way you weave humor into each of your posts. Not to mention the beautiful photography. I think you can have a great career in food writing. They look absloutley delicious, i love indian samosas,but i love these too, i love the idea they are made with the spring roll wrappers. I can never get my samosas shaped like you have done, so i have given up making them maybe i should give a another try. I've always wanted to make samosas so thanks for sharing! 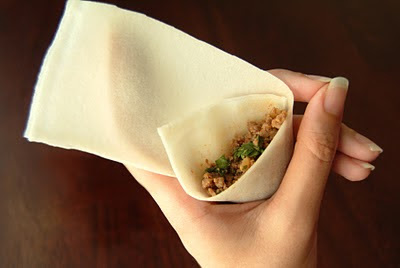 What a lovely reinterpretation of traditional samosas - I love that you do these in spring roll wrappers. And excellent for when pesky, nosy aunts visit - especially the kind that requires you to change their names when writing this post. (1) I want to see that hat. (2) Similarly, I want to see that purple slime. (3) I can't believe you made samosas for an impromptu visit. Go you! Am here for the first time...will keep visitng too...amazing amazing..love everything here...you seem to be expert on baking! great story i have quite a few aunts like yours, and that sound exactly what my mom would pull, great recipe..
You are triple blogger threat: (1) funny, (2) good food pictures, (3) delicious food. You rock. YES! Finally, someone makes Pakistani style samosas. I thought my mom was the only one who did (and she's not even Pakistani). I'm not a fan of those fat punjabi style samosas. Anyways looks great! We do lamb ones, chicken ones, and even paneer. They're delicious! Your post made me giggle. The samosas look great. In Bangladesh, we call the vegetarian version of thick pastry wrapped samosa, singara and the true samosa is the one you shared. Those samosas look delicious! Do they reheat well? (If I fry too many, as if that could happen) Thanks for dropping by my linky party!